Several years ago one of the young earth creation ministries wrote an article about how the author thought the earth looked young. At the time I thought it was pretty non-persuasive. As a youth, I can recall always thinking that the earth looked really old to me. Even though I grew up in the suburbs of Los Angeles, we did lots of hiking and traveling throughout the mountains and national parks of the Western States. Living in the shadows of the 10,000 foot high San Gabriel Mountains, they didn't look young to me. When I finally got back to the East Coast, what impressed me was how rounded and eroded the Appalachian Mountains looked compared to the San Gabriels. I thought they must be really old. Turns out they are. Yes, they look old. However, some recent trips have really impressed me about how the earth looks really old. Hence, I have finally taken the time to write this page. Most people who have ever hiked in a geologically active region (like California) have been impressed by uplifted and faulted areas of rock. A couple years ago I came across an excellent example of such a site just above Sturtevant Falls in Arcadia. The falls themselves are quite spectacular by Southern California standards. What most people don't realize is there is a wonderful trail that leads to the top of the falls and further upstream. The top of the falls pours over a large collection of granite rocks (which is why the falls are there in the first place, since the rock does not erode quickly). There is a stunning geological site just past the falls. Not only are the rock layers uplifted, but they are highly faulted. A dark layer of granite can be found splitting through the surrounding light layer. However, it is quite discontinuous. The breaks are dramatic and the black layer is offset in at least four places by a total of at least 15 feet. It you click on the image to the right, you can see a higher resolution image. Click here for another look at the same layer, faulted even more further upstream. The breaks show that the rock has experienced several very large earthquakes. The fact that it was first uplifted and then faulted in a different direction makes it look really old - certainly more than 6,000 years old. Death Valley is just one of the most amazing parts of God's creation and it ultimately motivated me enough to write this article. It is a must-see national park. The geology of Death Valley is just spectacular. Your first question is why it looks so eroded when it gets less than 2 inches of rain a year. The truth is that Death Valley has been around for a very long time. At Badwater, the lowest elevation in the U.S. at -282 feet, and other locations throughout Death Valley, are found pre-Cambrian rocks (greater than 540 million years old). In addition, following the last ice age, conditions weren't as dry, with Death Valley being near the edge of retreating North American glaciers. You will also notice uplifted rock layers in the midst of horizontal sedimentary layers. It is clear from the varied geology that Death Valley has experience a long and complex geologic history. In many places within the mountains, one will see an amazing assortment of rocks lying on the ground -everything from igneous to sedimentary to polished metamorphic rocks, within a few feet of each other. However, the most dramatic geologic features of Death Valley are its massive alluvial fans. Alluvial fans are formed when water carries dirt and rocks downstream. In Death Valley, the material washes down steep canyons before spreading out on the valley floor. At the base of virtually all Death Valley mountains one can see these alluvial fans. In many instances, alluvial fans from adjacent canyons run into one another. In some instances, they extend about a third the way up the mountainside. The testimony of these alluvial fans declare Death Valley to be very old, indeed. Some young earth creation websites say that to properly interpret what we see in nature, we need to put on our "biblical glasses." However, what they really want you to do is put on your young earth glasses. In fact, the book of Genesis, the very first book of the Bible, declares the mountains to be ancient.1 Nowhere does the Bible tells us to put on our "biblical glasses" to examine the creation. In fact, it says the truth of creation can be "clearly seen" from what God has made.2 No glasses necessary! Even the atheist is without excuse for his disbelief because of what they can see in the creation2 (even without glasses!). Does the earth look young? Parts of it do look young. However, it is only necessary to show that parts of the earth are old, in order to falsify the young earth hypothesis. I am convinced that those who think the earth looks young must live in cities. Once one gets out into nature, there are plenty of examples of the antiquity of the earth. Although young earth creationists say that one must put on "biblical glasses," the Bible says that the reality of creation can be "clearly seen" from what God has made. The earth looks old because it is old. God thought humanity was worth the effort of investing billions of years of His design to adequately prepare the earth for habitation by spiritual being created in His image. 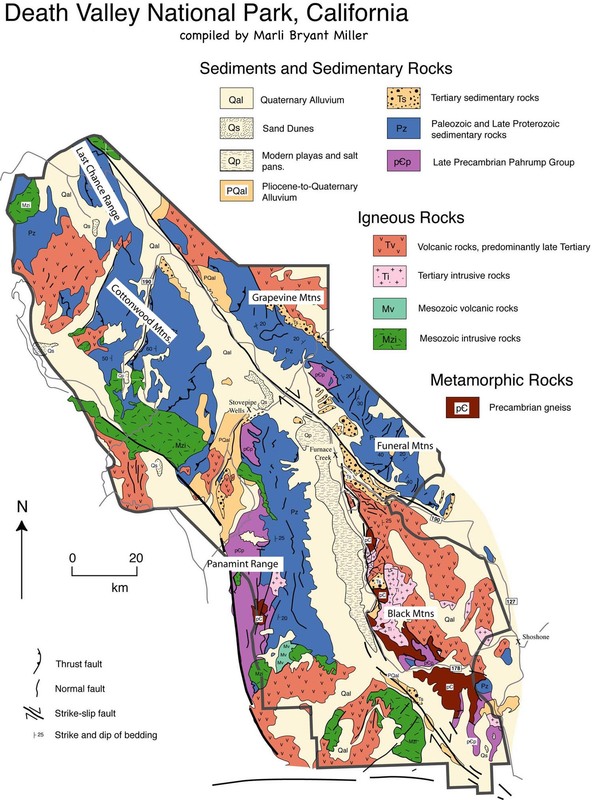 Geology of Death Valley National Park, USGS. Death Valley National Park Geological Map. Provided by Marli Bryant Miller. Death Valley Geologic Time, USGS.